My son invited me to join him and his Boy Scout troop for a weekend camping trip in the Sonoran Desert. The plan was to car camp and then do a long 11-mile (18 km) day hike to cover segments of a few historic trails, including the Mormon Battalion Trail, the Butterfield Overland Stage Route, and the Juan Bautista de Anza trail (trailhead and hike details here). As always, I did some research to see if we would be able to hang hammocks in this desert environment. I think this was called the “octopus cactus”, but to me it looks like a hula dancer. One of the first things people ask me about hanging hammocks in the desert is whether or not you can (or should) hang a hammock from a saguaro cactus. As far as I can find, there is no law against hanging anything on a cactus, but there is a law against destroying a cactus, which carries a class-4 felony (with corresponding fines and limited prison sentence). The fact is, hanging off a saguaro is not a good idea, ever. Unlike trees, saguaro cactus’ root systems aren’t very deep—like many desert plants—and are designed to rapidly absorb moisture. 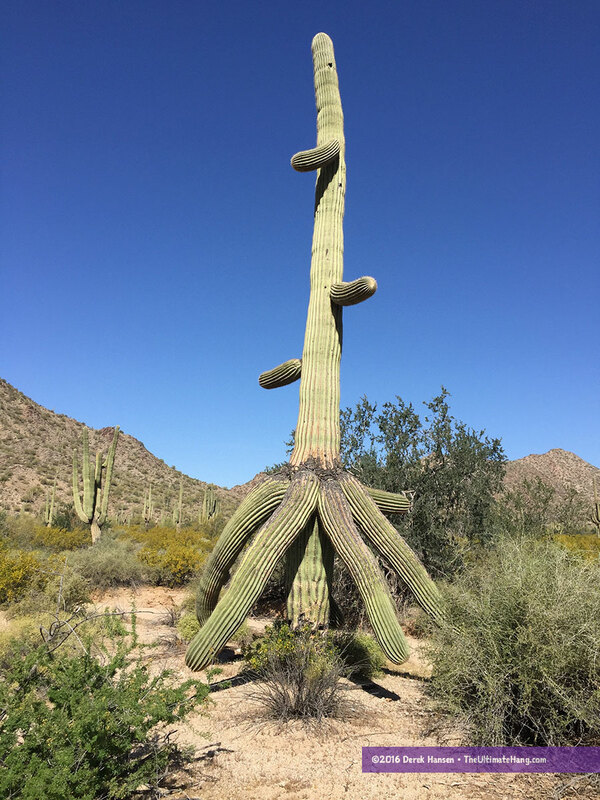 High tensile forces could very easily topple a saguaro (many of which suffer from rot near their base), and when full of water, can weigh in excess of 3,200 lbs (1,425 kg) (see the saguaro cactus fact sheet). The last thing you want is a saguaro falling down on top of you. My advice to anyone going hammock camping is to plan ahead and prepare. Usually for a multi-day backpacking trip, hiking near reliable water sources is one of the first main concerns. 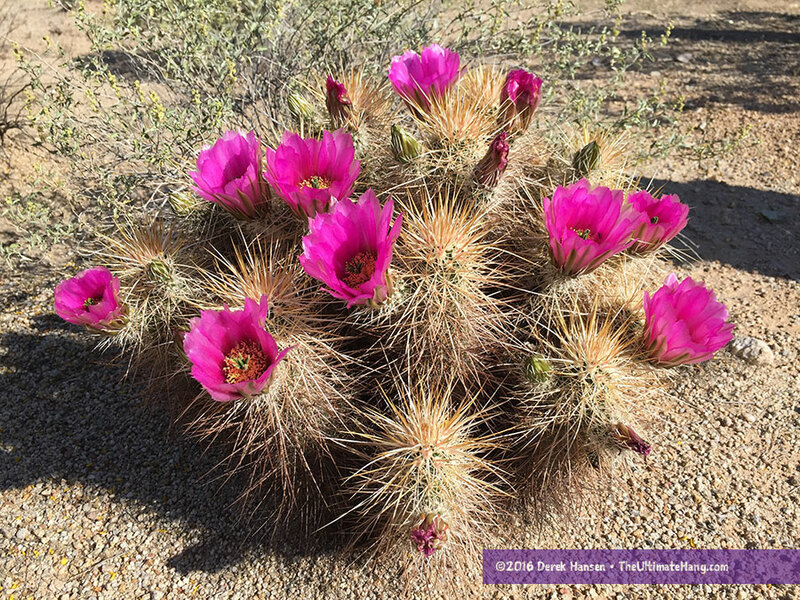 The good news is that vegetation is usually in abundance near water sources, even in the Sonoran Desert (which includes hikes in the Superstition Mountains). These trees and shrubs are usually more than adequate to hang a hammock. 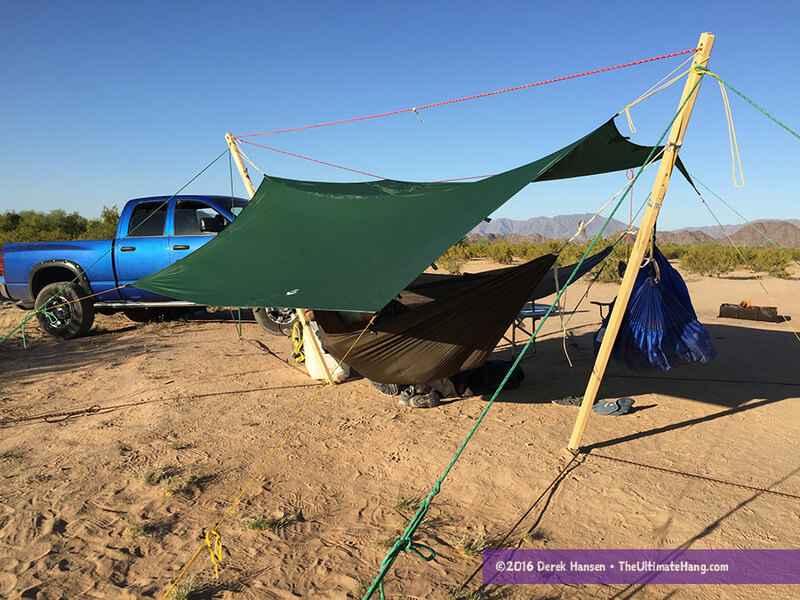 For our trip, I didn’t have enough intel to know for sure if our camp would be near any water or even seasonal washes, so I planned on bringing my 3-person hammock stand just in case. It turned out that the camp was near a large wash that has many large trees along its bank. A few of the scouts opted to hang near the dry wash. I decided to set up the stand, which also provided us with a nice shaded area near camp. My 3-person hammock stand set up like a champ. Everyone was impressed by how fast it set up and what a cool shelter it creates. The Hammeck Envy-S being set up along the bank of the wash. There were so many ideal places to hang a hammock. A few of the scouts and leaders ditched their tents in favor of a more relaxing (and less scorpion-prone) rest in hammocks. For those of us who were raised in the desert, we were thrilled to see it in bloom. What may ordinarily look drab and colorless to the uninitiated, I found to be full of color and life. The cactus were flowering, the trees were sprouting bright foliage, and new life was everywhere. It was fun to explore. The daytime temperatures we encountered in late March reached a record 91°F (33°C), which for us was hotter than most summers in Flagstaff. We left Flagstaff with highs in the 60s°F (15+°C), so we were broiling when we got to camp. At night, the lowest temperature was around 50°F (10°C). During the night, the scouts played night games while I hunted for scorpions. We found a total of four bark scorpions, which was a delight for all participants. Later that night we had arranged with a local scout group who came out and did a reenactment of the Mormon Battalion encampment. It was interesting to learn about the history of their adventure and how the trail was made. That diurnal temperature shift was pretty dramatic, so while we felt comfortable without much insulation when we went to bed, we needed some good insulation by morning. My son slept in the Bison Bag hammock and he needed another top layer by 5 a.m. I slept comfortable the entire night in the Dutchware Gear Halfwit Hammock with an Arrowhead Equipment synthetic under quilt and the DD Hammocks top quilt. One thing I LOVE about hammocks is sleeping above the bugs, in this case, the Bark Scorpions. I was meticulous about hanging all my gear off the ground. I had a gear hammock strung next to me where I could store my flashlight, water bottle, shoes, etc. When we cleared and packed camp, we were scorpion-free. 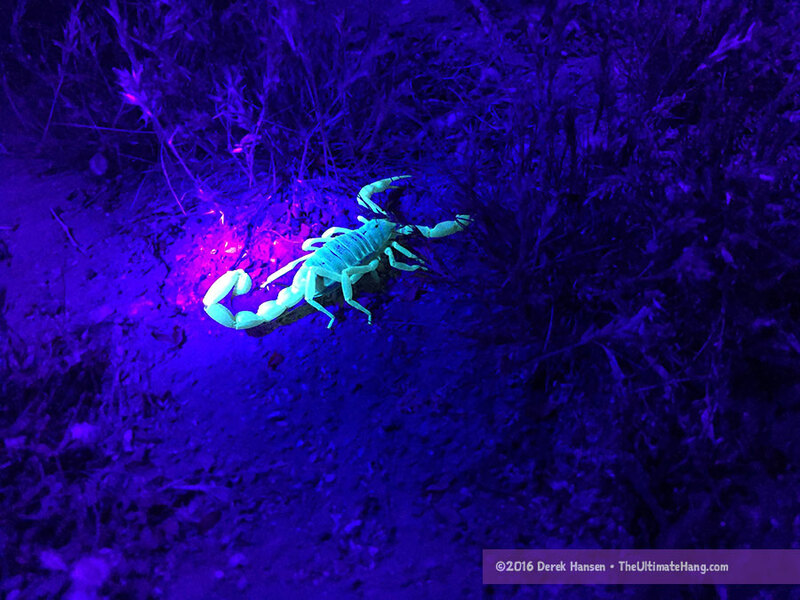 However, the scouts who slept in tents found a few scorpions who had crept under their tents during the night. I’ll be honest that the hike was mundane. The purpose of these historic trails was to shave off as much milage and cut across the desert to intercept the Gila River. As such, the ecology and topography was unvaried but direct. We made a straight march from Christmas Camp to the Butterfield Pass through the mountains, a distance of about 7 miles (11 km), and then wound through the pass until we reached Happy Camp. 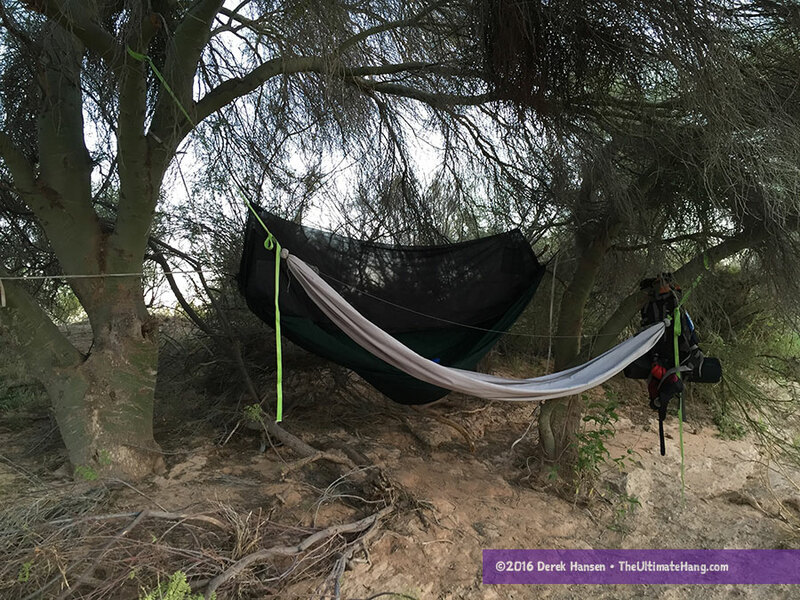 Once we reached the pass, there were a few standing trees where I was able to set up a hammock chair for a quick siesta while we waited for the entire troop to regroup. Hiking along these historic trails certainly gave us appreciation for the hardships encountered by the different groups who made their way along this very desolate region of the country. From there we hiked cross-country to the highway, finishing just over 11 miles (18 km), where we had some vehicles set up to ferry us back to camp. Carrying 3L of water per person was required to stay hydrated. Besides the scorpions, we only encountered one rattlesnake, which was easily identified and avoided. Do you have a hammock trip report you’d like to post? Send me an email. Wow, great trip report and awesome photography! Thanks for sharing.